Last year Google announced a Suggested App Actions feature at the I/O developer conference. Following this, Google Photos has introduced a ‘Crop and Adjust’ feature for Android devices which will allow scanning documents. This allows taking improved photos of documents by adjusting colors and also remove backgrounds using Artificial Intelligence (AI). It is expected to be soon available for iOS as well. 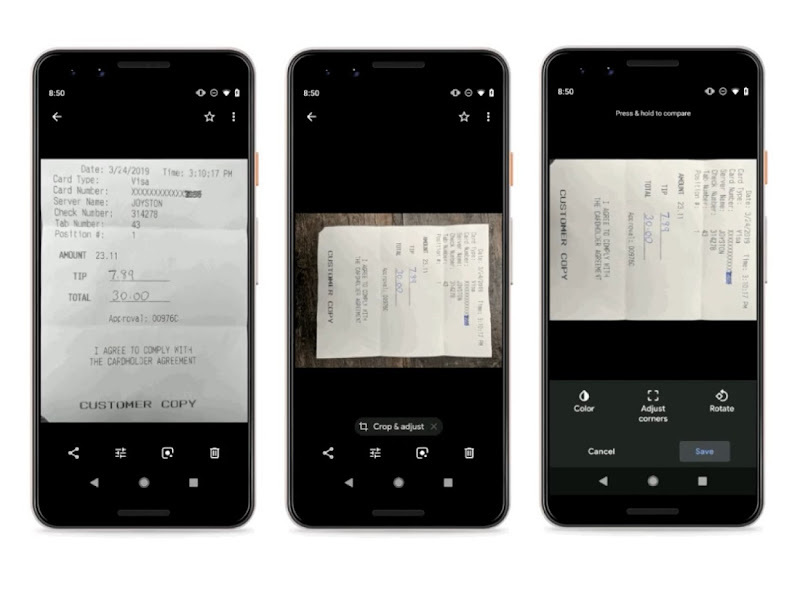 Google announced this new feature through a tweet, saying that with a single tap documents can be cropped on Google Photos. When the captured document is recognized by it, a Crop and Adjust pill will be shown at the bottom of screen. By selecting it, further three options will appear, Color, Adjust corners and Rotate to adjust your documents. The color option improves the readability of the document by adjusting the colors of the picture. With the Adjust Corner options, the background of the document in the picture is removed and the edges are cleared. Artificial Intelligence is used to perform these actions. Also, the image can be rotated manually. To compare the edited picture with the original, press and hold the image. Cancel and Save buttons can also be seen letting you either save the picture or discard the editing. Google has already announced about Suggested App Actions for Google Photos, which will recommend certain options by using AI, at the I/O 2018. The document images can also be converted into PDF format, to easily share it with others. This new feature is expected to be available after the next update of Google Photos.